Above: Lamium, a drought-tolerant groundcover in stone bins with hosta. Background. The Organic Foods Production Act of 1990 required that the USDA establish standards for organic products, and these standards were first published in the National Register in 2000. The legislation set up the National Organic Program. Local certifying agencies were set up; the one in Pennsylvania is Pennsylvania Certified Organic (PCO). An alternative to the Federal program is Certified Naturally Grown, which smaller farmers find more congenial and less expensive. However, organic gardening has a long prior history with many roots, one of which was greatly expanded by Rodale Press through its magazine Organic Gardening. Distinction. We distinguish between biointensive minifarming (or Grow Biointensive as John Jeavons now calls it) and organic growing. Biointensive represents a school of thought -- an integrated set of practices to raise food in a sustainable way, by building soil and minimizing inputs, especially machine and fossil fuel inputs. Biointensive focuses on self-sufficiency -- growing for the household. By contrast, organic growing comprises of a set of techniques and practices without reference to any particular school of thought or production regime. Organic farmers grow for market, and are likely to use outside inputs and machinery to realize efficiencies in production. Our Organic Gardening Primer provides a thorough introduction to organic growing. In PART 2, starting on page 32, we have prepared diagrams describing how you can apply the principles of PART 1 to a small backyard garden. 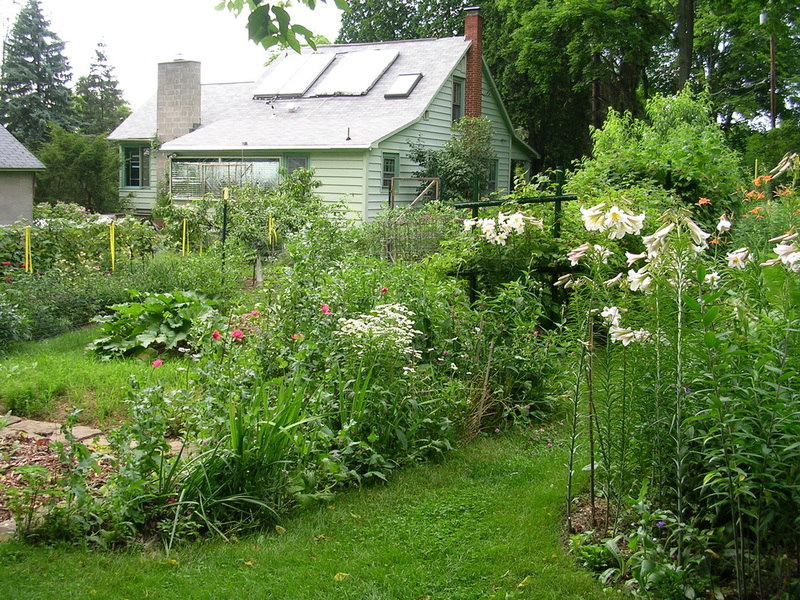 We prepared this Primer after giving workshops over a ten year period to local gardeners, garden clubs, adult education classes, and other groups. Cover Crops represent one of the most difficult practices to master in organic gardening. In our Cover Crops Primer we describe how to use cover crops in your garden. We presented this at FarmFest, organized by PCO in August of 2013. Fencing. Productive gardens require good fences to keep out animals. In De Fence we provide a photographic chronology for constructing a superior fence. Of course, more than fencing is required, and we are planning a follow-up to document other practices for controlling our animals "friends." Winter Greenhouse. We learned a lot on growing greens during the winter from Eliot Coleman, whose Four Season Harvest describes how to grow food in the late summer and fall to harvest throughout the winter. We show how we built our winter greenhouse in this photographic essay, which we presented at a PASA 2013 workshop, "Food With Less Fuel: The Low Energy Homestead." In Keeping (On) Track, also part of the PASA 2013 workshop on "Food With Less Fuel: The Low Energy Homestead," we discussed how we used charts, tables and maps to keep track of things, and to keep ON track. Native Bees. There are 4,000 species of native bees in the country, and 400 species in Pennsylvania. With the decline in the European honey bee, interest is turning to our native bees to provide pollination.